The fate and whereabouts of Syrian dentist and women’s chess champion for many years, Dr. Rania Abassi, her husband and their six children remains unknown after security services took them from their Damascus home last week. Men believed to belong to the military security branch took Rania’s husband, Aburrahman el-Yassin (Abu Ahmad), from home after ransacking it on March 9. They returned two days later, March 11, and picked up Rania and the couple’s six children: Dima (14), Intissar (11), Najah (9), Wala’ (8), Ahmad (4) and baby daughter Layan (12 months). Nothing has been heard of the family since. 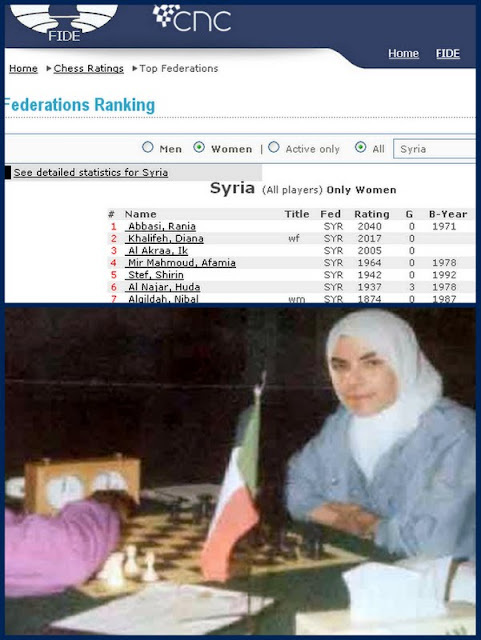 Dr. Rania, who won national, Arab and Mediterranean chess championships over the years, is still ranked Syria’s number one woman chess player by the World Chess Federation. Aljazeera TV anchorwoman Ghada Owais is currently in Aleppo doing a series of video features on Syria’s two years of revolt. Last night’s focused on what two young women are doing to help the rebels. One -- speaking as “Asma” -- is a volunteer nurse in a makeshift field hospital in a rebel held area of Aleppo. Owais: Having read Arts at university, why choose nursing? Asma: We were ready to give our lives for the revolution from day one. When the Free Syrian Army entered Aleppo, most doctors fled. The medical cadres also left. We had to fill in for them, and we did. Owais: Do you have what you need here to treat patients and the wounded? Owais: You’re short of what? Asma: Everything – equipment, medicines, even bandages. Everything. An incident on an Aleppo street led to her wedding to Mahmoud seven months ago. Shrapnel from a tank shell outside her home hit Mahmoud. She helped him. They fell in love. They’ve been husband and wife and fighting side by side for seven months. Tamer: But who’s the boss? 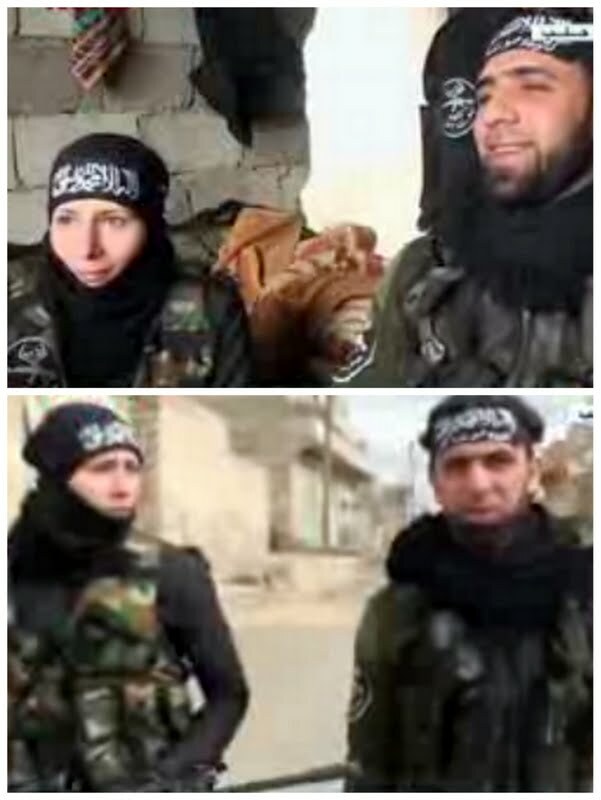 Mahmoud: In the battalion, she is one of the fighters. Umm Jaafar: You can say that at home I command a brigade while he commands a battalion!